After having spent a week reviewing all of the editing extensions for Photos for OS X, I have a clear favorite: Tonality by Macphun. I bought my version from the Mac App Store for $19.99, which includes the standalone version. But I only use it as an editing extension for Photos for OS X. Personality, I like the integrated workflow. This app combines two things that appeal to me: an extensive selection of high quality presets, with plenty of controls to fine tune the final image. The preset categories include: Basic, Architecture, Portrait, Dramatic, Outdoor, Street, Vintage, Film Emulation, Toning, and HDR, each with many options within. And for the most part, you could stop right there. However, if you like to tinker, take a look at the tools in the right side adjustments panel. 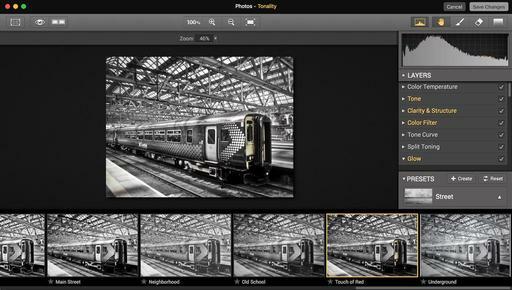 Once you've finished working with the shot in Tonality, click on Save Changes to return to Photos for OS X. You can press the M key to see the original shot, even though you've left Tonality, and even Revert to Original if you wish. Chances are, however, that you'll want to share the edited picture using any of Photos extensive publishing tools. Bottom line here: I think Tonality helps me be more creative in my post production work. External Editors is one of the most affordable, and exciting, editing extensions for Photos for OS X. It's available in the Mac App Store for 99 cents. It allows you to connect practically any image editor to your Photos library. I tested it with two of my favorites: Photoshop CC and Alien Skin Exposure X. It worked perfectly on both counts. The workflow is simple. Open your image in Edit mode in Photos for OS X. Choose External Editors from the list of editing extensions you have loaded. Editors will open your image and present you with all the available editing apps on your Mac. Choose the one you want, then it takes you there for adjustments. After you've finished working on it, just click Save. You're back in the External Editors interface. Choose Save Changes and your edited image is returned to Photos for OS X. And here's the kicker, if you press the M key, you can see the original version of your shot. And if you want, you can Revert to Original. But for Jpeg shooters, this workflow is far better than the old style of roundtripping, because even though you're using an outside app, the workflow remains non-destructive. And in that case, I can't think of a better way to spend a buck. This is from a guy who previously would only use Silver Efex Pro for his black and white work, but I've come to appreciate the B&W Adjustment in Photos for OS X, and the optional plugin, Tonality by Macphun. Intensity - If you think about how saturation works for color, that's what the intensity slider does for B&W. As you move the marker to the right, Photos intensifies the tones in the image. If one cube of sugar makes your coffee sweet, two cubes makes it even sweeter. That's what intensity does. 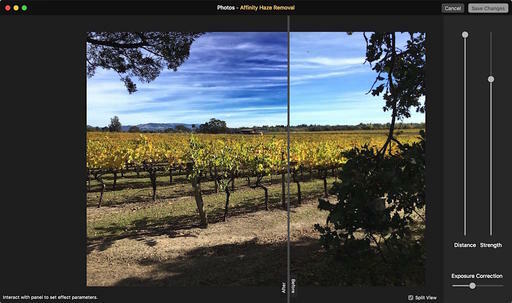 Neutrals - This slider affects the gray areas of the image by lightening or darkening them. 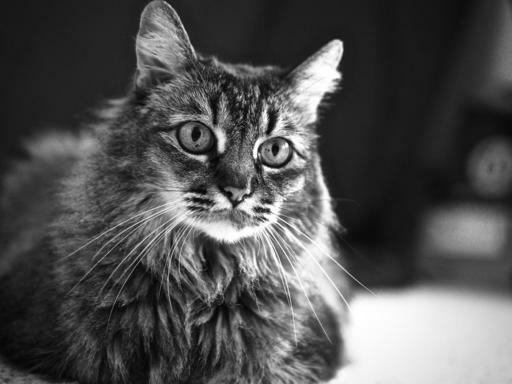 For this image, I thought that darkening the gray areas helped create a nice separation from the white markings of the cat, including her whiskers. Tone - This adjustment could really be called contrast, because that's what it does. Moving the marker to the right increases contrast, and to the left flattens it. Grain - To complete the film-like B&W effect, we can also add grain. Not only does this provide an analog feel to the image, it can make it appear a bit more crunchy. Tip: Even though we're applying monochrome effects to our picture, it's still color inside. 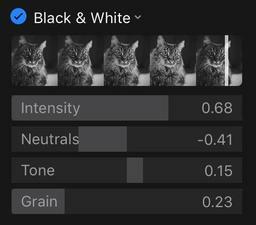 For example, you can still tweak the tones in your B&W by using the temperature and tint sliders in the White Balance panel. Try it. Photos provides an amazing amount of control for your B&W pictures. Oddly enough, White Balance isn't part of the default set that appears in the Edit menu in Photos for OS X. And I say "oddly," because it's such a necessary tool, and the Photos version of it is very good. 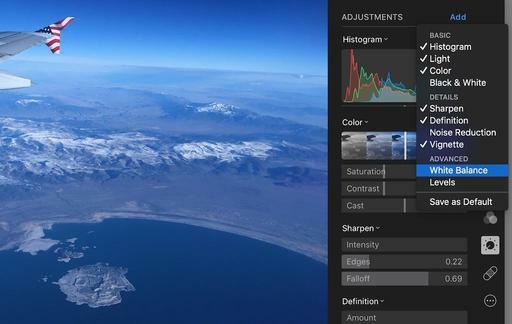 To make sure it always shows up, open an image in Edit mode, click on Adjust in the righthand sidebar, click on Add, and choose White Balance from the popup menu. Then go back to Add and select "Save as Default." It will now automatically appear in your Adjust panel. The adjustment itself is quite powerful and very much like the version we had in Aperture. Here's a short video on how to use it. And for other hands-on tutorials, be sure to take a look at Photos for OS X Essential Training on lynda.com. I cover everything you need to know to get the most from this surprisingly powerful image management application. The list of cool editing extensions for Photos for OS X is growing steadily: Aurora HDR Pro, DxO OpticsPro for Photos, Tonality, Affinity Retouch, and more. Mac users who want to take advantage of these tools without disrupting their existing workflow can do so easily by setting up a referenced library. You can play with all of these tools without disrupting your workflow. All you have to do is simply point Photos to the existing home of your master files. In my case, they're on a small flash drive connected to my Mac. Those images are the source files for my Aperture, Capture One, and Exposure X work. But I can also play with them in Photos without changing the masters or interfering with the libraries in my other programs. Here's a movie on how to set up a referenced library. Once I have the referenced library set up, I can play with tools such as Aurora HDR for Photos. Generally speaking, I've found the editing extension version of these apps easier to use and totally non-destructive. I can still view the original at any time, even after I've left the extension interface. Playing with the image in the editing extension Aurora HDR Pro for Photos for OS X. All images by Derrick Story. If you want to see where your original picture is residing, just right-click on the image and select "Show Referenced File in Finder." There it is, exactly were it was before you had all of this fun. My guess is that a lot of Mac-toting photographers are missing out on this experience, just because they haven't looked in to it. I'm telling you, these extensions are cool. Check them out. And for other hands-on tutorials, be sure to take a look at Photos for OS X Essential Training on lynda.com. After months of research and testing, I've settled on the applications that I'm using for my photography workflow in 2016. I thought you might be interested in my selections and why. Capture One comes the closest to the robust file management that I liked so much in Aperture. Its system of folders (called Groups), projects, and albums feel right at home. And the RAW decoding is beautiful. My images look great in this application, and there are tons of editing tools for refining them. Overall, this will be the ultimate home for my RAW files. Pros: Great library management, excellent RAW decoding, serious editing tools. 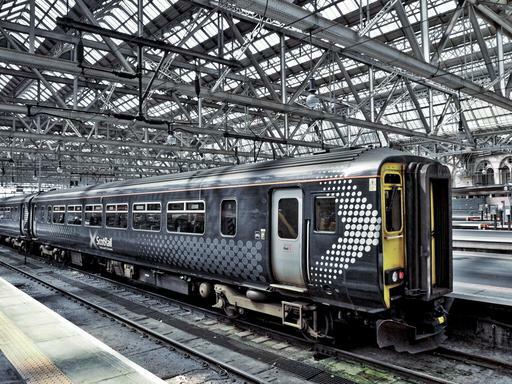 Cons: Does not accommodate imported PSD files, very still-photo centric, not cloud connected, a serious investment at $300. Robust photo management is great, but I have a lot of quick-turnaround jobs that I need to deliver fast. I'm really enjoying Exposure X for these scenarios. It reads the files off my memory card, puts them on my drive, then lets me star rate or add color labels, edit, and export - blazingly fast. The adjustment sliders are terrific, and the film emulation presets are fun and creative. So not only am I working fast, the images look wonderful afterward. Pros: Creative, great user interface, fast, lots of goodies. It's not the do-everything imaging app that it replaces (Aperture), but Photos for OS X is great at what it endeavors, which is connect your devices, backup your mobile shots, and provide a fun editing environment. I shoot a lot with my iPhone, and I don't want to have to worry about the preservation or sharing of those pictures. Photos just makes it happen. I love the built-in editing tools, and what it doesn't include natively, is now being addressed by 3rd party plugins. And that implementation is terrific. My iPhone images are easily adjusted, instantly shared, and always backed up. How could you not take advantage of this great app if you're an iOS shooter? Pros: Easy, fast, mobile, smart, easy geotagging, and free. Cons: Still no star ratings or color labels (ugh! ), weak metadata management, not great for RAW shooters with new cameras (slow updating of RAW profiles). I know a lot of folks want just one photo application to handle all of their needs. And depending on how you shoot, that's a reasonable request. But for someone like me who's using an iPhone one moment, Contax film camera the next, Olympus mirrorless after that, then a Cannon DSLR for a commercial shoot, one app just isn't going to cut it. So these are my three for 2016. For hands-on tutorials to master Photos for OS X, be sure to take a look at Photos for OS X Essential Training on lynda.com. I have a Capture One Pro Essential Training in the works that should be out soon. Over 100 movies on using that app. Keep an eye out for it. I've actually had people say to me, "You mean there's a retouch tool in Photos for OS X?" Yes, there is, and it's actually quite good. Just open the image in Photos on your Mac, and follow the simple steps that I show you in this movie from Photos for OS X Essential Training on lynda.com. And once you remove those small blemishes and imperfections using Photos on your Mac, the changes are propagated to all versions of that image on your mobile devices thanks to iCloud integration. So fix it once and be done with it. With iOS 9.2, Apple opened the door to use a Lightning SD Card Reader for uploading images directly from a memory card to an iPhone. We've had that functionality with an iPad, and now it works for iPhones too. The process is fairly simple. Attach a Lightning to SD Card Camera Reader to your iPhone, and choose Import All or select the individual shots by tapping on them in Photos for iOS. Now tap the blue Import or Import All label in the upper right corner. The images will be copied from the memory card into your Photo Stream. If you have RAW+Jpeg pairs, only the Jpegs will be visible on your mobile device. You'll see the message, "Multiple formats imported" reminding you of how this works. But the RAWs will be accessible for editing when you use Photos for OS X on a Mac. Of course you'll need iCloud photo sync enabled for the images to automatically appear on your computer too. And when editing, be sure to choose "Use RAW as Original" from the Image menu while in Editing mode. OK, now getting back to your iPhone... if you don't see your recently uploaded files in Collections in Photos for iOS, tap on the Albums tab and view the Last Import album. They should be there. The pictures should also be visible in the All Photos album. From this point forward, you can mark images as Favorites, share them on social sites, edit them with Photos' adjustments, or work on them in other applications. This capability is also handy for viewing what's on a particular SD card that you find rattling around in the bottom of your backpack. Either way, with the large screens we now enjoy with the iPhone 6S and 6S Plus, adding the card reader function makes a lot of practical sense. 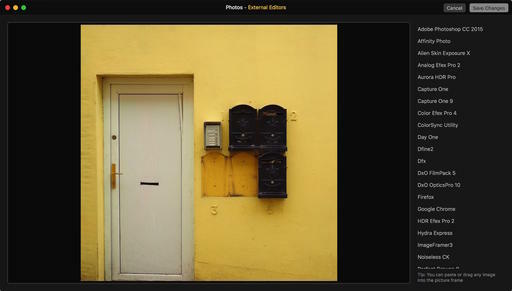 For more help mastering Photos for OS X, be sure to take a look at Photos for OS X Essential Training on lynda.com. This is one of the easiest ways to add location information to any photo, captured with any camera. Just open the image in Photos for OS X, and follow the simple steps that I show you in this movie from Photos for OS X Essential Training on lynda.com. By doing so, not only are you adding geotags to your pictures, but Photos also recognizes this information for search. So, for example, if you add geotags to the MGM Grand Hotel in Las Vegas, you can also search for images using any of those labels. If you prefer articles to videos, you might want to read my How to Geotag in El Capitan Photos App. And for other hands-on tutorials, be sure to take a look at Photos for OS X Essential Training on lynda.com.